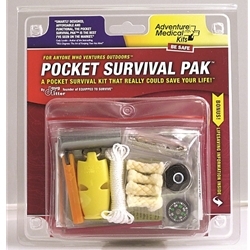 A pocket survival kit that really could save your life! The Pocket Survival Pak™ contains a collection of survival tools for when you find yourself abandoned, stranded, or lost in the outdoors. Keep it in your pocket and on your person because, "If it isn't with you, it can't save you." The Pocket Survival Pak™ is for backpackers, hunters, pilots, snowmobilers, hikers, or anyone who enjoys the great outdoors! Designed by Doug Ritter, Executive Director of the Equipped to Survive Foundation. Size: 4" x 5" x 0.652"